It’s the moment we’ve all been waiting for: the big reveal of the 2012 VPI Hambone Award® Winner! Thousands of votes were cast by the public, but only one precious pet could be named this year’s winner. 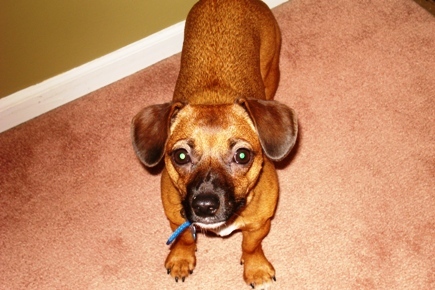 Nearly a year since he was found buried alive after squabbling with a skunk, Peanut, the dachshund-terrier mix wins the title of VPI’s Most Unusual Pet Insurance Claim of the Year! Peanut, who was found buried in the dirt beneath his owner’s deck in Sicklerville, N.J., following the skunk scuffle, is the fourth recipient of the annual award. This year’s race was close as Pebbles the domestic shorthair cat, who went on an accidental 15-mile road trip in a car engine was nipping closely at Peanut’s heels until the voting period ended. By the time the polls closed, however, Peanut had pulled away, earning the coveted title and claim to fame. Peanut earned his nomination last October when his owners, Keith and Christy Wolfram were given quite a scare when they couldn’t find their pooch following a fracas with a ferocious skunk. 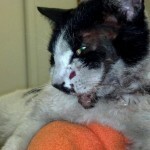 Fortunately, he was found early the next morning and made a full recovery less than two weeks later. Around 2:30 a.m., first responders from the Winslow Township Fire Department in Sicklerville, N.J., apologized to Keith Wolfram and his wife Christy – they had done everything they could. Refusing to give up, Christy grabbed a shovel and continued to search for their dachshund-terrier mix Peanut, who had become buried in the dirt beneath their deck after wrangling with a skunk. According to Keith, his dogs have had a number of disagreements with local wildlife. 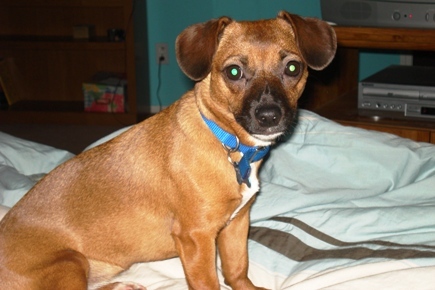 Peanut especially has been known to chase four-legged intruders through small openings beneath the deck in their backyard. This battle was unlike any other, however, and left Peanut buried alive in the dirt beneath their deck. After hours of searching, and several holes in Wolfram’s deck later, Christy hadn’t given up hope. The firefighters administered oxygen to Peanut and advised Keith and Christy to get her to a veterinarian, fast. With Peanut barely breathing and reeking of skunk musk, the Wolfram’s rushed their companion to a 24-hour animal emergency facility. She was treated for hypothermia and kept under veterinary care for two days. 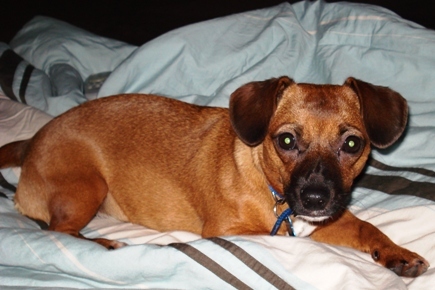 After about a week and a half, Peanut made a full recovery – which was more than the Wolfram’s could say for their deck. Second Place – Pebbles the domestic shorthair cat (Rio Linda, Calif.). After getting stuck in a car engine, Pebbles went on a 15-mile road trip before being taken to a veterinary hospital to treat lacerations and a broken jaw. 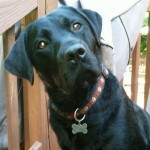 Third Place – Bayley the Labrador retriever (Lothian, Md.). While playing inside with his furry friends, Bayley shattered a 55-gallon aquarium that left a two-inch gash on his chest. The 12 nominees were chosen from more than 1 million claims VPI receives annually. They were considered among other uncommon medical claims and selected by VPI as the most unusual of the bunch. All pets considered for the award made full recoveries and received insurance reimbursements for eligible expenses. For more details on the 12 VPI Hambone Award® nominees, to read their claims, or see their photos and videos, visit VPIHamboneAward.com. On behalf of us here at Veterinary Pet Insurance, congratulations to Peanut and all of the 2012 VPI Hambone Award® nominees!